Like everyone else, I have lots and lots of boiled eggs in the refrigerator right now. Last year my chickens, inexplicably, stopped laying eggs the week of Easter. I actually had to buy eggs! This year, Mrs. Bickerson, our duck, and our little Bantam hen started laying again after a long while of no eggs. The big egg added to a daily deposit of a little one, combined with the limitless supply that the other hens give us each week, ensured that we had plenty of eggs this week for Easter. We ended up coloring 31 of them and still had enough to make a Brunch Casserole Easter morning and a Washington Cake for our BBQ dinner dessert the night before. What do you do with a bunch of boiled eggs? Make Deviled Eggs, of course. Peel eggs. Halve them. Remove yolks and wash yolk residue from whites. Beat yolks with salt and sugar until free of large lumps. Add remaining ingredients. I use a mixer to beat them smooth. Fill a large piping bag with a large tip with the yolk mixture and pipe into egg white halves. Note: Garnish with paprika, celery seed, relish, pimentos, caviar…whatever you like. I make these sweet like my mother and father make them. I grew up with them sweet, so am shocked when I bite into a sour Devilled Egg. If you can’t tolerate them sweet, omit the sugar or decrease the amount. 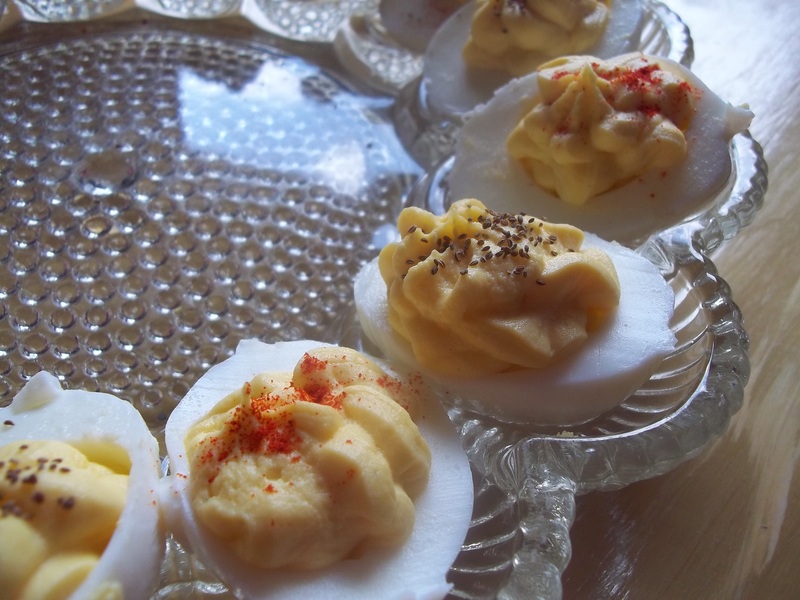 My mom always adds anchovy paste to her deviled eggs – it sounds weird, but it’s delicious! And I don’t live anchovies! You should try it some time. Oh, wow. I hate them, too, but buy a little can when I make Caesar salad, use half an anchovy and throw the rest away. lol Maybe I should buy paste and use if for eggs, too.